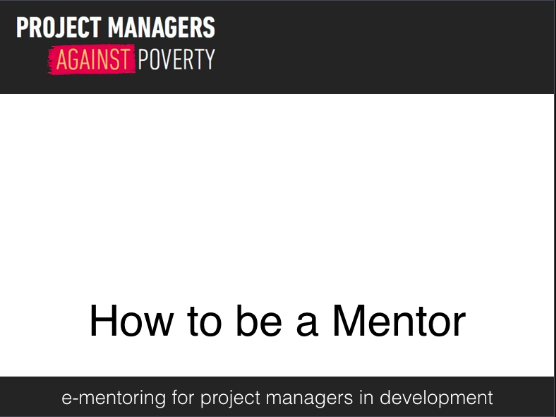 Serving as a mentor to project managers involved in international development offers the intrinsic satisfaction of contributing to the success of development projects. It's a great way to give back and make a difference! It's also a great learning opportunity. One of our mentors said of his mentee: "It was really nice sharing with her my experience and help her grow and find her own way. I had people on my way who helped me grow and become what I am today and its only payback". To become a mentor take a look at the video "How to be a Mentor" and follow the simple steps below. There's lots of useful information on our Resources page to help you. Also there's a flowchart here to give you an overview of the mentor process. The service is provided at no cost to users. You should be an experienced project manager. You can reside anywhere in the world. You do not need to have mentored before. If you haven't mentored before we can provide resources to help you. Other mentors on the programme can give you support if you need it. It would be desirable for you to have experience of managing development projects or third sector projects. A knowledge of PMD Pro would also be helpful. The PMD Pro (Project Management in Development for Professionals) was established to build on established methodologies and so provide common standards and practical guidance to run development projects. It recognises that while good project management principles are universal, development projects have unique challenges. Watch the short video. PMD Pro is managed by pm4ngos and an excellent on-line starter guide to PMD Pro can be found at pmdprostarter.org and at pmdproforward.org. Also a quick guide to the PMD Pro can be downloaded for free here. Ideally you will be a member of a professional organisation such as the Project Management Institute or the The Association for Project Management. This Code of Conduct sets out the roles and responsibilities of mentors and mentees who participate in the PMAP Mentoring Programme, and it is a condition of participating that you agree to this. Account Details: Enter your email address, a username, password and a confirmed password. The password should be at least 8 characters in length, and should include 1 uppercase character and 1 number. Personal Profile: Enter your name and a brief pen picture of yourself (50-60 words) and enter your contact details (these can remain private). You can add your LinkedIn address if you have one (without the https://) and Skype address. Mentoring Profile: Provide detailed (but concise) answers in all boxes. In your Career Summary please include details of projects you have worked on. Skills & Expertise: Enter the skills & expertise that you can offer. Try to be as accurate as possible as this will help the right mentee to find you. Click the question mark icon to see the drop-down skills list. Select the relevant skills one at a time and click Add each time. You can add your own Skills but it's better to keep to the list as this will improve your chances of a good match. Once you are happy with your profile click Submit (you can always login and change it later). You will receive a confirming email for your registration, awaiting activation by the administrator. Make sure that this message is not spammed out! You will receive another email once your account has been approved and activated. Once your account is active please log in to complete your registration. Read and agree the MentorNet Acceptable Use Policy. The last step! Click on Settings and tick the box Available To Mentor and set the Maximum Mentees between 1 and 4, the number you are most comfortable with. If you wish, you can add a picture in Settings by chosing Edit Profile Image and then follow the simple instructions. You can also change your password which should be at least 8 characters in length, and should include 1 uppercase character and 1 number. Before you log out just check your profile through and tweak if necessary. You can always go back and change things later. You will receive an email to alert you that you have been matched to a mentee. You can now send your mentee a private message by logging in and going to their profile from the left hand menu, and then clicking on the Messages icon at the top right of their profile screen. The Mentee will message back to arrange a time & date for an Initial Meeting. You will agree how you will communicate: Skype or FaceTime, or by using the secure conversation (message) facility. Note that you may receive messages through the website from prospective mentees to enquire whether you might be the right mentor for them before the formal match process begins. It is important that you make a record of your meetings with your Mentee in your Activity Log on the website. Login to the website and click the Activity Log tab. Your first entry should record arrangements for this Initial Meeting. There's more information about how to keep an Activity Log here. On the agreed date and at the agreed time and date the Mentee will intiate the Skype/FaceTime session a conversation through the website as agreed. Introduce yourself, review each other’s experience & discuss the issues that need to be resolved. Decide whether or not to go ahead with a mentoring relationship. Record the details of this meeting and the outcomes in your Activity Log. There's more information about the Initial Meeting and what to do at here. The mentee's goals & objectives as the focus of our mentoring relationship (add 3 or 4 objectives). How often you will meet. How long you think the mentoring partnership should last (this can be updated as the relationship progresses). How you will communicate. The website has a secure messaging system and an area where you can exchange docuemnts. Or you could meet on Skype. Record the details of this Agreement on your Activity Log or create a joint document and upload it to your document area where it can be shared. There's more information about how to write a Mentoring Partnership Agreement at here. Provide regular feedback to each other and evaluate progress, and rework your Mentoring Partnership Agreement if necessary. If progress is not being made or circumstances change either party may end the relationship on a "no-fault" basis. It's important that you always record the content of your meetings and discussions on your Activity Log on the website. Understanding perspective – The mentor and mentee may have very different set of experiences, values and ambitions from each other, especially if they are from a different culture. It is therefore, important to recognise their existence and validity, even if you do not fully agree with them. Having a good understanding of each others perspective will lead to more fruitful discussions and outcomes. Developing networks – A mentor can help a mentee develop their networks by sharing networking techniques and helping the mentee understand how to develop and maintain relationships with others. Being a critical friend – Plain, straightforward speaking is not always comfortable either for the mentor or the mentee, but it is one of the things they are most likely to appreciate. Plain talking and effective challenging will lead to a more meaningful dialogue, deeper reflection and better learning outcomes. Listening - Both mentee and mentor must take time to listen to the the other and fully understand each other's position. Giving advice – it is important for the mentor to hold back from giving advice and jumping straight into solution mode. The mentee should be helped to develop their own solutions through the use of effective questions. However, there are times when a simple “This is what you need to do” is an appropriate approach. The trick is to understand when to give advice and when to hold back. This will undoubtedly come with practice and experience. Encouraging and supporting – There will be times when a mentor just needs to be there to listen and help a mentee regain their confidence. Jumping in to solve their problem for them will not help build self reliance. What if we don't get along? - Successful mentoring depends on the forging of a good relationship between the mentor and mentee. If mentor and mentee do not 'gel' - for whatever reason - either party is entitled to seek to end the relationship on a "no fault" basis. Review how things went and also record this on your Activity Log. It is the mentor's responsibility to send a message to the PMAP administrator to formally close the relationship. Share your experiences with us at feedback@pmap.email. We can all learn from experience good or bad! A flowchart showing the e-mentoring process for mentors is here. or log in and send a secure message to the Administrator (Peter Marlow) via the website.